Hear your music the way it was meant to sound with the In Phase XTC4cx component speaker set, giving you clear highs and deep lows. These speakers come with a 3-way crossover so you can pair them with another set of XTC speakers for superior sound. In Phase have launched the new XTC series, sticking with our heritage we have continued to use our Famous Glass Fibre Woven Cone, giving for a more rigid and stronger cone without the additional weight producing a faster and more powerful bass response regardless of the power. 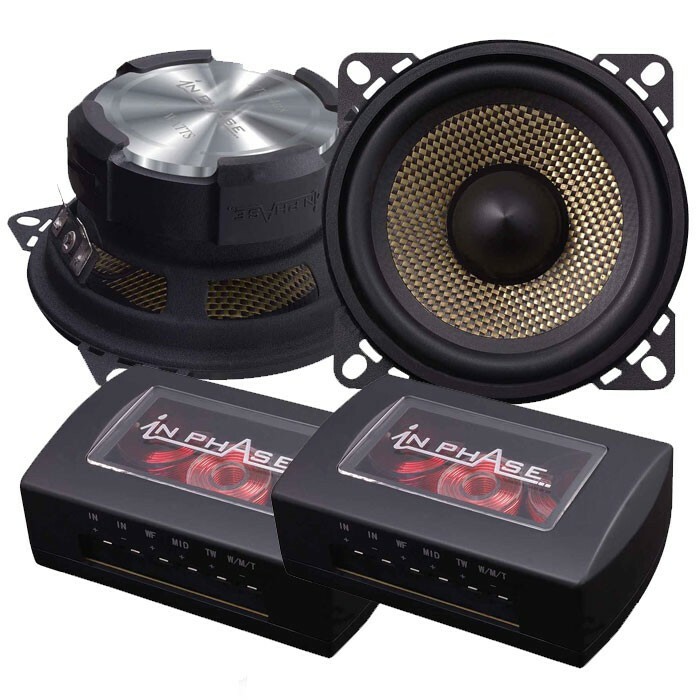 We have kept our rotary tweeter design to allow a more tailor sound stage inside your car by adjusting the tweeter to the required listening angle the listen can enjoy crystal clear sound even when the speaker is position at the bottom of the door. Power handling and efficiency have been improved so you get more sound from your audio system. Powered coated dampener speaker chassis helps to reduce the distortion from the speaker chassis thus improving the focus of the sound and giving more detail in the sound stage and focus. Rubber boot design helps to wrap the speaker magnet protecting it from the elements as well as absorbing vibrations. Cosmetically finished to perfection this speaker not only is beautiful to listen to is beautiful to look at. Overall you will be impressed with the New XTC speaker line up from In Phase, happy listening. I brought these speakers as i was in need of a upgrade on my BMW 535. I was given great advice and went ahead with the recommendation i was given in the Leicester store. After instillation these were powered by a little amplifier IPA 602 also using a src6 processor. The results were amazing. It sound a lot better than BMW factory upgrade. Also the speakers can be turned right up with out the loss of quality. Great recommendation with greater service. Will this kit fit in the dash mount & allow me to add tweeters such as SXT1 using only 1 channel from the head. Then fit 2nd speakers in rear?? yes they will fit into your van and will allow you to use the SXT1 tweeters. Can these speakers fit my 2008 bmw 520d ? you would have to check mounting depth, previously we have had customers purchase these speakers for the BMW 5 series and they haven't sent any information to suggest they dont fit, we would normally recommend something like the blam speakers as an upgrade or the focal ES100K components as the 4" uses a smaller magnet. What vehicle are you installing these into?